St Cyprian’s Church, Glentworth Street, London, Saturday 14 May 2011. 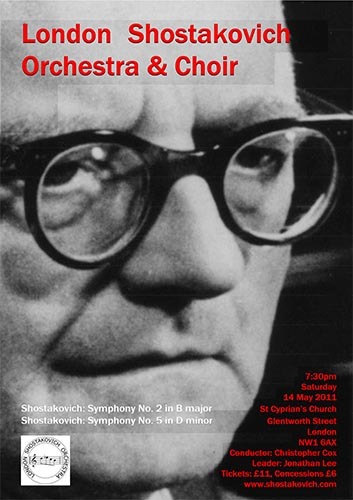 Shostakovich’s words in 1940 provide a revealing insight into both of the works that we shall hear this evening. The Second Symphony, written in 1927 when the composer was twenty, remains a curiosity, rapidly disappearing from the repertoire after its successful first performances and not returning to the concert stage until the 1960s. It was not recorded until 1965 nor performed in the United Kingdom until 1969; and Shostakovich himself seems to have been ambivalent as to whether he viewed the work as a success or a failure. The Fifth Symphony, on the other hand, was recorded as early as 1938 and had reached London by 1940. It has remained the most widely played of Shostakovich’s fifteen symphonies, and the composer considered the work central to his creative output. The Second Symphony was commissioned by the Publicity Department of the State Publishing House Music Sector to commemorate the tenth anniversary of the October Revolution in late 1927. It can thus be seen as a relatively early example of the Bolshevik desire to present the coup of 1917 as a popular revolution, as well as of the incipient cult of Lenin following his death in 1924: the leader is thus invoked in quasi-religious terms in the choral section of the work. Shostakovich undertook the commission enthusiastically, making a trip to a factory to assess the tessitura of the factory siren he went on to employ just before the entry of the choir (in the event, in F sharp, with an orchestral replacement in French horns, trombones and tuba also stipulated). Indeed, he completed the score in less than four months. It will also be remembered that prior to the victory of Stalin in the Bolshevik power struggle in 1929 the new Soviet Union enjoyed a degree of cultural freedom and contact with the Western avant-garde: the work may thus reflect the influence of composers such as Hindemith and Honegger, whose works were performed in Moscow and Leningrad during this period. The uses of declamation in the choral finale, and of string glissandi in the central section of the work, are also indicative of the experimental impetus behind its conception. The Second Symphony can also be viewed as the first of a variety of works written over Shostakovich’s creative life which reflected the initial idealism of 1917, which, notwithstanding the horrors of the Stalin years, the composer never appears to have lost entirely, together with a wish to communicate such aspirations directly to Soviet audiences. If, then, the musical idiom of the work does not, on first hearing, appear entirely characteristic, there are intriguing pre-glimpses of the epic style of, for example, the Seventh Symphony and film music to The Fall of Berlin, as well as the opening of the third movement of the Thirteenth Symphony in the striking use of tuba solo. The work also reflects several other features of the composer’s style: his use of string unisons; his predilection for the sonorities of the double bass, bassoon and piccolo, and for juxtaposing extreme registers of the orchestra; and the fortissimo use of percussion at moments of climax. The relatively short single-movement form is striking. Shostakovich highlighted ‘the execution of the entire composition’ as ‘dialectically linear,’ initially describing the work as a ‘symphonic dedication’ (i.e. akin to a cantata) rather than a symphony. He seems to have found the composition of the last section most difficult, finding Aleksandr Bezymensky’s revolutionary verse ‘extremely unmelodious,’ and even at this early stage in his creative life he may have been wary of invidious comparisons with Beethoven’s Ninth Symphony. The ‘neatness’ of the work which Britten highlighted is perhaps most apparent in the massive first movement in D minor, in which its ‘energy’ is channelled into sonata form based on two main subject groups, albeit with a significantly expanded exposition; and the final movement alla marcia is also cast in sonata form. On the other hand, one should also acknowledge other more characteristic features of Shostakovich’s existing musical language: the prominent part accorded the piano, for example, previously employed in the First Symphony; the haunting four-bar celesta part which ends the first movement and links it with the coda of the Fourth Symphony; and the short second movement scherzo and trio, replete with trills, pizzicato and glissandi, which reflect Shostakovich’s profound admiration for Mahler and, in its use of xylophone, his predilection for the grotesque. If Shostakovich did nothing to discourage such an interpretation, the nine-bar celesta and harp solos which conclude the third movement in F sharp major suggest something rather more profound at work, and it may be significant that Shostakovich was to employ the former instrument in a variety of contexts from 1960 onwards, increasingly in association with themes of eternity and death, as he reflected, with some dissatisfaction, on his creative life and legacy. It is certainly likely that the apparent creative reorientation of 1936-7 always played a key part in such soul searching on Shostakovich’s part. If one approaches the work in this way, one might also detect the brooding presence of Stalinist brutality in much of the brass and double bassoon writing elsewhere and the (f)ff use of bass drum and timpani in the work’s final three bars. On the other hand, over seventy years after the circumstances which shaped the work’s conception, its particular genius seems to lie not only in reconciling a deeply personal musical language to a form acceptable to the arbitrary and ultimately transient dictates of Socialist Realism, but also in creating a score ‘commensurable with the highest specimens of Russian and German-Austrian symphonic traditions’ (Levon Hakobian), and one whose musical heart enables it to connect directly and profoundly with audiences, as Britten himself identified.